Shop, Skate and Celebrate 200 years! Busy sidewalks, city sidewalks, dressed in holiday style... In the air there's a feeling of Christmas! That's right! 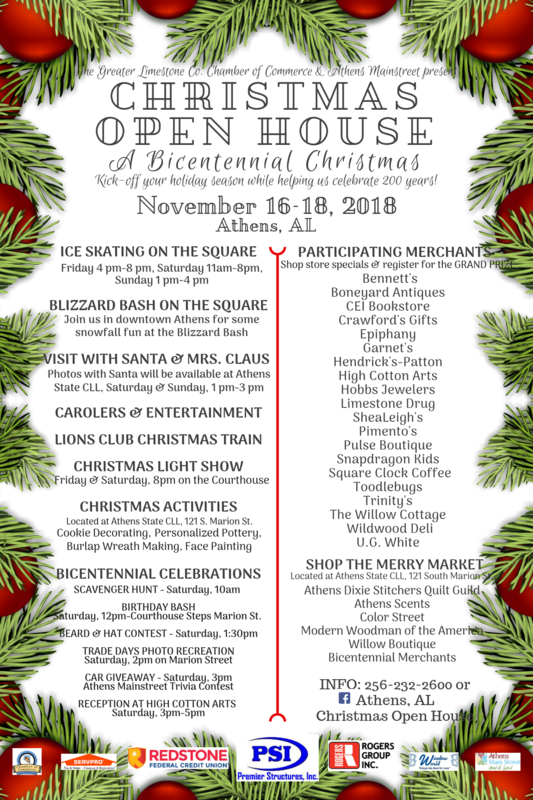 Once again all the joys of the Christmas Season are headed back to downtown Athens for Christmas Open House, November 16, 17 and 18! This year marks the 32nd year of the Athens Christmas Open House, organized by the Greater Limestone County Chamber of Commerce and Athens Main Street. Each year, Christmas Open House kicks off the holiday shopping season. And this year, Athens is celebrating their Bicentennial so the community is invited to come “Shop, Skate, and Celebrate 200 Years”. The theme for Christmas Open House will be “A Bicentennial Christmas”. In addition to our traditional Christmas Open House activities, there will be a number of Bicentennial celebrations also taking place during the weekend.